A magnificent park with an extensive network of hiking trails winding through old-growth temperate rain forests, majestic waterfalls and a fascinating diversity of plant and animal life. The park is also famous for the run of spawning salmon in the fall. You can walk along the river to view the salmon and each year parks naturalists run programs in the visitor centre, (Freeman King Nature House), near the mouth of the river. At the height of the run in mid-November, eagles arrive to indulge in a salmon feast and more than 250 can show up in a single day. It is best to view the eagles using binoculars or a telescope from the new viewing platform. 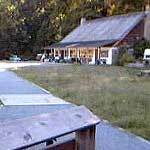 For information on Goldstream Park Interpretive Programs call 250-478-9414. To reserve a campsite call 1-800-689-9025. To reach Goldstream follow Hwy. 1 from Victoria towards Duncan and watch for the signs approximately 18 km (11 miles) northwest of the city. Campgrounds are on the left and the Freeman King Nature House is on the right.